It's possible that this is the most beautiful breakfast food I've ever in my life seen. 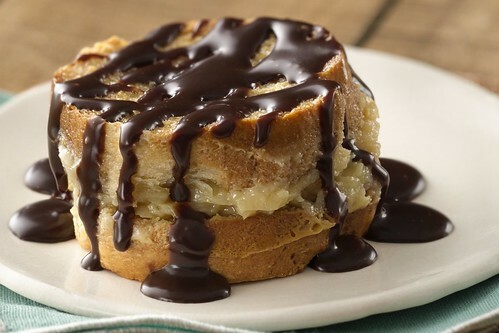 Kristen Abbott of Paoli, Pennsylvania is to blame for the extreme pleasure that is Boston Cream French Toast. Perfect for brunch! Heat oven to 350°F. Bake crusty French loaf as directed on can. Cool 10 minutes. Meanwhile, spray 13x9-inch pan (dark pan not recommended) with Crisco® Original No-Stick Cooking Spray. In large bowl, beat sweetened condensed milk, 1 cup of the cream, the egg yolks and vanilla with wire whisk until well blended. Pour half of mixture into pan. Trim ends of bread; cut into 20 (about 3/4-inch) slices. Place slices over egg mixture. Pour remaining egg mixture over bread slices. Bake 30 to 33 minutes or until light golden brown. In medium microwavable bowl, microwave remaining 1/4 cup cream on High 20 to 30 seconds or until hot. Stir in hazelnut spread until smooth. For each serving, with spatula, remove 1 piece French toast and place custard side up on serving plate. Top with another piece of French toast, custard side down, forming a sandwich with custard in the center. Drizzle each serving with 1 tablespoon chocolate hazelnut sauce.